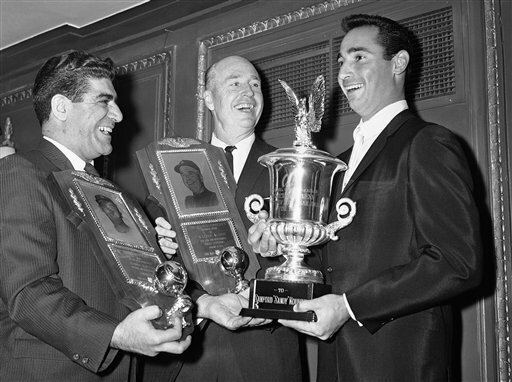 Sportswriter Joe Mooshil, left, in 1964 with L.A. Dodgers Sandy Koufax and Walt Alston. A few decades ago when a young reporter entered into the world of sports, it wasn&apos;t the players or the coaches that were the most intimidating: it was the veteran sports writers. This is meant not as a knock; rather, I mean it with total respect. My own memories of those days returned after another great sports writer passed away last week: 85-year-old Joe Mooshil. He wrote for the Associated Press for over 40 years and covered every sport in town. Joe was one of several respected, crusty, opinionated characters who surrounded me when my career in sports began. These men taught me lessons I will never forget and that I use more times than not. They were fearless, honest and had integrity. Sadly, most are gone, but if you watched Sportswriters on TV, which was on many years ago, you got a glimpse of what covering sports was all about back then. Former Chicago Tribune/Daily News/Chicago Today writer Bill Jauss, Mooshil, the late Bill Gleason of the Chicago Sun Times/Southtown/South Bend Tribune, “youngster” Rick Telander of the Sun-Times and moderator Ben Bentley “discussed” sports with gusto. When I came on the scene, they were not fond of me entering their men’s club. I had two strikes against me, one for being a woman, the other for working in radio. Over time they got used to me; I wasn&apos;t going away and I showed respect for them and their profession. But it was so different back then. . . they all took notes with a notepad and pen — no electronics — and sometimes they dictated their stories over the phone. They pounded out copy on a typewriter, and when they were on deadline after a game, they hammered away with a beer, a cigar or cigarette in hand. Observing the way they worked was key for me. The late Jerome Holtzman of the Chicago Tribune/Chicago Daily News /Chicago Sun-Times, the “dean” of baseball, was so revered that players would go to him. When he was in a group talking to a player, he had very deliberate and poignant questions. Jauss was masterful, with his joyous smile and bushy eyebrows. He would perch himself right in front of the players to ask his questions and always knew a fact or circumstance that was unique from the game. Sun-Times columnist Ray Sons (now retired in Colorado) was kind and considerate and his writing was always done with that tone. He approached players with a quiet dignity. I have tried to model my approach that way — a one-on-one interchange, as conversational as possible. During a game it was common to see the late Bill Gleason of the Southtown pull a sandwich and a bottle of beer out of his bag in a white sock (he thought he was hiding something). He wore a pith helmet with a fan when it was hot. Talking with him was always a lesson of passion for sports and his fight for what he believed was right. He had battles with players and owners and was unabashed with his love for the Sox. When he discovered my father, a journeyman pressman, was involved in a 12-year-long union labor dispute with the Tribune, he would always offer his support. Of course, the language he and most others used when they didn’t like something was indeed colorful. But I didn’t blink; I was in their world and they were in the center. They had every right to be because they had earned it — and I had to do the same. Joe Mooshil didn’t back down from anyone; if a player or coach needed to be put in their place, he did it. But Joe had a kinder side, too. As I started going on the air he pulled me aside and gave me some advice. You could tell he was a father of three daughters; I listened and learned. He cautioned me not to use terms that some of the male sportscasters did — like "dinger" for home run — and he was right. He knew I was different and advised me to own it. Sportswriting has changed so much with the Internet and the decline of newspapers. Too many of the best were forced into early retirement and too many are no longer with us. I count myself lucky that I learned from the best — even if I was in radio and a woman.